Take showering beyond the ordinary with this 3/4-inch MasterShower thermostatic valve. When paired with compatible trim, this valve delivers a high-temperature limit stop for added safety and a high-flow rate for precise, consistent temperature control. Factory calibrated comfort setting at 104 degrees Fahrenheit. 17.2 gpm (gallons per minute) high-flow rate is ideal for multiple outlet installations or rapid bath filling. For use with MultiChoice Universal Trims and T1837, T18037-XO, T1817, & T18017-XO diverter trims. Can be tested with air (200 psi) or water (300 psi) without cartridge using supplied test cap. R18000-XO includes separately plumbed valve and jet module. Master shower 3/4 inch Thermostatic Valve Take showering beyond the ordinary with this 3/4-inch MasterShower thermostatic valve. 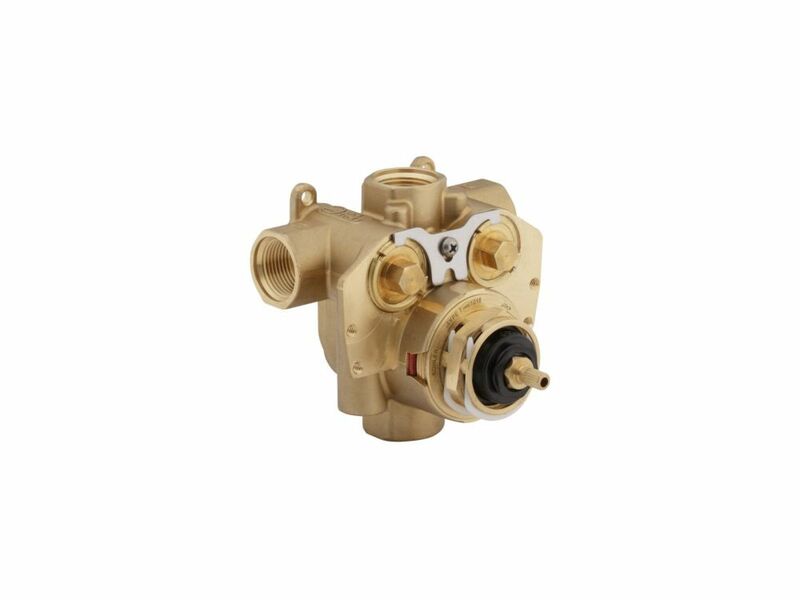 When paired with compatible trim, this valve delivers a high-temperature limit stop for added safety and a high-flow rate for precise, consistent temperature control.